Today’s AM fix was USD 1,292.00, EUR 942.65 and GBP 764.81 per ounce. Yesterday’s AM fix was USD 1,291.50, EUR 943.46 and GBP 767.56 per ounce. Gold climbed $1.10 or 0.08% yesterday to $1,294.70/oz. Silver rose $0.03 or 0.15% to $19.42/oz. Gold is marginally lower today at $1,293.50/oz and remains in lock down in an unusually tight range between $1,287/oz and $1,306/oz this week. Gold in Singapore, which often sets the price trend in Asia, traded at $1,292.23/oz prior to a bounce to just over $1,295/oz. Gold has been in a very narrow range between $1,283/oz and $1,310/oz for a month now. There are a lot of things going on underneath the surface of the calm gold market this month. That superficial calm is likely to give way in the coming days as we appear on the verge of a sharp move to the upside or downside once gold breaks out of the recent range. A break below $1,283/oz is possible and this could see gold quickly fall to test longer term support at $1,200/oz. This is likely if the technical traders and computer manipulations continue to dominate. However, should physical demand pick up on rising geopolitical tensions and the return of Indian demand with the easing of import duties, gold should quickly challenge resistance at $1,385/oz and $1,418/oz. 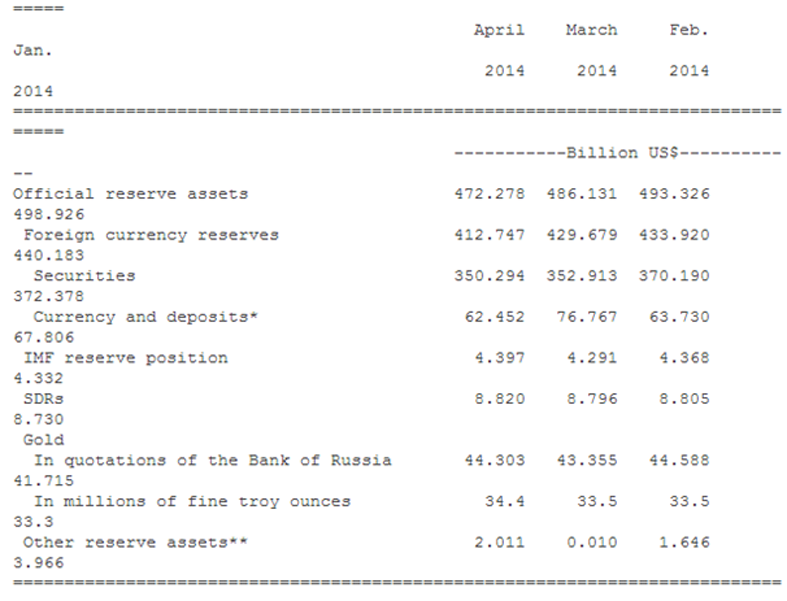 The Russian central bank has again increased its gold reserves by another 900,000 ounces worth $1.17 billion in April. 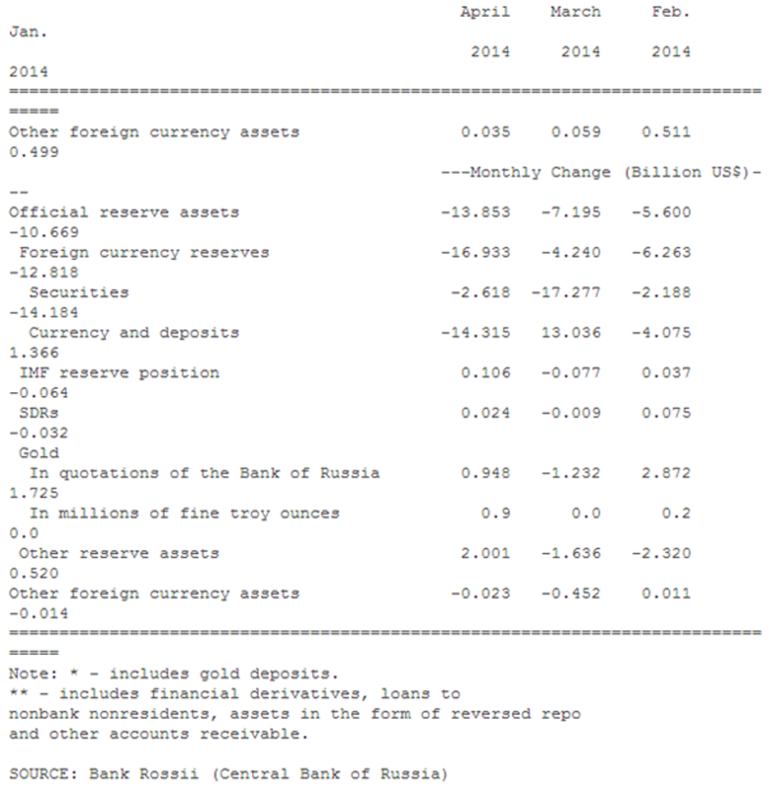 Russia's gold reserves rose to 34.4 million troy ounces in April, from 33.5 million troy ounces in March, the Russian central bank announced on its website yesterday. The value of its gold holdings rose to $44.30 billion as of May 1, compared with $43.36 billion a month earlier, it added.